Sometimes it's difficult to find anywhere to park... but I'm not complaining. Not all major cycle-routes are given a particularly grand name in the Netherlands. While other countries use terms such as "superhighway" for mere cycle-lanes, in this country, more modest terms are used for very good and direct cycle-paths. One of these terms is "Fietsroute+", favoured by the Groningen-Assen region. The first Fietsroute+ was constructed in 2007 to cover the 10 km distance between Assen and Vries. For a couple of years, this featured on my commute, and the wonderful smooth surface and continuity of the path helped with riding at high enough average speeds that a 60 km round trip was quite feasible. This particular routes has also featured in several blog posts including about the required standards for a Fietsroute+ (worth reading) and how it is used by many secondary school students. Another Fietsroute+ heads East out of Assen, covering the 6 km distance between Rolde and Assen. However, both of these are in Drenthe, not in Groningen and this post is about the First Fietsroute+ in the province of Groningen. Like the other Fietsroute+ routes, as well as other major routes without that designation, it's designed to be safe, wide to avoid conflict, and smooth and direct to cope with higher speeds than an average cycle-path. The combined population of Zuidhorn and surrounding smaller villages is only around 18000, yet 1500 people per day cycle along this route. Their numbers are boosted by people for whom this section is part of a longer route. It is hoped that the quality of the new cycle-path will attract yet more people out of cars. The winner of this "race" was professional cycle racer Bauke Mollema. Bauke Mollema grew up in Zuidhorn and rode to Groningen each day to go to school. He tells an amusing anecdote about how when he made his school journeys along the old path, they would ride with two students next to each other and it too cramped for three, while with the new improved path five abreast will be possible. I've seen how school children and students cycle, and I've no doubt that this will happen. Bauke is a local hero. This year he took part in the Tour de France, though sadly he had to stop after the 11th stage due to problems from injuries suffered on the sixth stage. Better luck next time ! It is only by continual improvement that cycling can be expected to grow. Standards are so high as they are in the Nnetherlands because they need to be higher here than elsewhere merely to preserve the modal share which already exists, let alone to make it grow. While it is relatively easy to convince the first few percent of the population to cycle because they are the least demanding, if the modal share is to become higher, it becomes steadily more difficult because the target is no longer "low lying fruit". Rather, to maintain and build on a high modal share for cycling, the target audience is necessarily those people who are not easy to convince to ride a bike. They may have longer journeys, be more easily scared off from cycling, come from from demographic groups who are less likely to cycle, or perhaps they simply more likely to prefer an alternative such as driving a car. This is why development of ever better cycling facilities is not a luxury but a necessity not only in the Netherlands but also elsewhere. Campaigners can make no progress by asking only for what is good enough for themselves. Such campaigners are themselves the low-lying fruit and they are already riding. For progress, the standards have to improve and this isn't achieved by aiming low. The benefit of good quality cycling facilities is for everyone, even professional cycle-racers. In related news, Bauke became a father last week. Gefeliciteerd Bauke en Jane ! mornings, all the racers are riding. Earlier this week, a customer in Meppel ordered a few dynamo lighting parts. It's within cycling range, so I asked if he minded waiting until Saturday so I could deliver them in person. I made the delivery this morning and I took photos on the way. The customer's apartment turned out to be 44 km from our door. As with most journeys in the Netherlands by bike, almost all the distance was covered on cycle-paths, save for our residential road and the pedestrianized area (with bikes allowed, like in this example) in the middle of Meppel where the customer's apartment was located. It took an hour and twenty minutes of riding against a slight headwind to reach my destination. road. There is no benefit from that. I took the same route back, so I had a slight tailwind. With the tailwind it took an hour and ten minutes to get back home. That's an average speed of over 37 km/h (23 mph) including riding back through the pedestrian area slowly, slowing down at junctions and at one point coming to a near standstill to pass a horse. The return journey was also almost entirely on the same cycle-paths, though as I got close to Assen, to avoid waiting for an open bridge which had built up an impressively long queue of backed up cars, I took the nearly car free service roads on the other side of the canal from the main road and cycle-path for a few km. It is peak season for tourism by boat and it's really nice that by bike you often have alternatives to waiting and can continue your journey when the bridge is open. separation, resurfaced and very smooth. As well as being peak season for canal boats, July is also peak season for racing bikes. The Dutch are very enthusiastic followers of cycle-sport, and the Tour de France is everywhere at the moment. Cycle racing is something that people not only like to watch but also to participate in in large numbers. At this time of year, the cycle-paths have far more lycra clad cyclists on them than is the case in winter. While the majority of cyclists who I saw today were not lycra clad and not riding racing machines, I decided it would be interesting to take photos of these cyclists as I rode this morning. It's surprising how often people from overseas who don't understand this country write that the Dutch are "slow cyclists" and that cycle-paths make them slow. Someone tried to make a a comment on my blog this week in which amongst other incorrect things he claimed that the Dutch cycle "at 6 mph". If his comment had had some facts in it, or was the basis for reasonable discussion, or indeed if it had been on-topic for the post which he sent it to then I would have approved it. However, this was an off topic post by someone who had not read what they were writing under and how was trying to misinform and stir trouble. In part, I've written this blog post as a response, to try once again to point out that simplistic arguments like "Dutch cyclists are slow" are so very short of the truth. It would be nice to think that people contemplating writing the same sorts of things would first read the myths and excuses page, but those who have their own fixed view of the world tend not to bother. So, something about the speeds with which people really ride their bikes. In general, speeds are of course slower in any city than in the countryside. Anyone who really wants to ride fast goes out of the city and rides there. IME, the average rolling speeds for city cyclists tend to be above 20 km/h. Small children, pensioners and people with disabilities tend to be a little slower, groups of school children tend to be in no hurry at all, but of course there are also many club cyclists on racing bikes and other people who like to go quickly. There are at least as many cycling enthusiasts per capita in this country as in any other country. The actual average speed by bike in the city of Groningen has been measured and it's 14.2 km/h, or just short of 9 mph. This is not especially quick, but this is for an average person and it is not the rolling speed, but the overall speed for a complete journey including stops. By car it's much slower - 9.6 km/h. This is perhaps the source of the "6 mph" speed quoted by some VCers. It applies to cars, not bikes, but anyone who came here and insisted on riding their bike on the road would have their speed reduced to this level. Any lack of speed perceived is not because "the Dutch are slow" but because in the Netherlands, even people who are slow still ride bikes. This is a country where the demographics of cycling include everyone, not just fitter than average people. Another cyclist spotted this morning. facilities are inclusive of everyone. Right across the Netherlands, bikes are faster for shorter journeys than cars. This is the result of deliberate policy and it is very important. If cycling were not both extremely convenient and extremely safe, then it would certainly not be so popular as it is. My journey was fast and convenient because of the cycle-path network in this area. I was home today in time to have a shower and sort through my photos before lunch and then continue on with the day. Making a delivery in this way has less to do with running our business than giving me an excuse to go for a ride and get some exercise, which is of course beneficial to everyone. The health benefits of cycling are recognized in this country just as in any other, but because cycling is always a pleasure in the Netherlands, these benefits are realised to a greater extent than in other countries. The yellow thing at the bottom of the photos is my Mango velomobile. It's a good part of what makes it possible for me to ride faster than younger and fitter people on "hi tech" carbon racing bikes. Streamlined bikes like these are the fastest practical production bicycles in the world. They are more common in the Netherlands than in any other country and this is in no small part due to the Dutch cycle-path network providing such a good habitat for people who like to ride fast. If some of the maneuvers at junctions in the video seem unconventional, it's probably because you're watching one of the many simultaneous green junctions. However, on my trip there were no traffic lights at all, while there would have been several sets to negotiate if I'd driven instead of cycles. It's quite common in the Netherlands that you avoid traffic lights when cycling. Click for my picasaweb album of racing cyclists on cycle-paths. This is where they ride in NL, not on the roads. Cyclists have more direct, safe and pleasant journeys if their routes are separated from the routes taken by drivers. 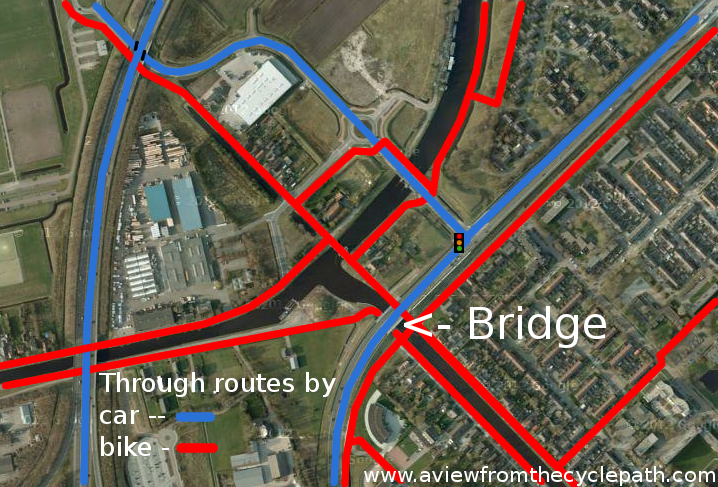 This video shows examples of how on the west of Assen, cycle-routes are mostly quite separate from driving routes. By this I don't only mean that cycle-paths run alongside the roads, but that the routes themselves are different. It is increasingly common in the Netherlands that cycling and driving routes are unravelled from one another. The map (courtesy of Google Maps) shows many of the routes featured in the video. Blue routes are for cars, red routes for bikes. The traffic lights featured in the video can be seen on the map, as can the blue arched bridge, one of four bridges clustered together, three of which make part of viable routes for cyclists, and two of which make viable routes for drivers. The blue arched bridge, the largest of four bridges close together in the centre of the map and the only one of the four map on which cyclists can't ride, was actually built to benefit cyclists. It adds nothing for drivers over the flat junction which was in this position until 2008. In fact, the construction of this bridge removed the option to makes turns left and right to use what is now a cyclist only through route. This bridge was constructed to take the dual carriageway ring-road above the cycle-path so that cyclists neither had to wait at a crossing, dive through a tunnel or climb over a bridge. I've shown all the possible through routes by car on the map but note that they do not join up in the top left corner where a road runs under the motorway bridge next to a cycle-path. By comparison, I've only shown the relatively heavily used bicycle through routes. In fact, while drivers have relatively few through routes to choose from, every road and street on the map except for the one car only road (on which there is a traffic light) and the motorway can be used as a through route by bike. The majority of the map have been drawn as solid red for bikes, even though these residential streets are not useful through routes by car. between noise barriers. Would you prefer this ? In the video, I highlight one of the no cycling signs on the ring-road which runs over the blue arched bridge. These signs are sometimes misunderstood by people in English speaking countries, who think that cyclists being banned from roads like this one leads to having to take less direct, less convenient routes than would be the case if cyclists could ride with the cars and trucks. Actually, of course, this is completely incorrect. In this case, should our intrepid cyclist defy the sign and cycle with this bus and van, he/she would simply find another set of traffic lights four hundred metres from this one. Fighting for the "right to ride" on roads such as this one would be a meaningless gesture. No-one is interested in doing so, because it makes no sense at all to prefer to ride in those conditions. This is a road which exists to deal with the consequences of cars. As you see on the map segment above and in the video, there are far more viable through routes by bike than by car, and cyclists frequently avoid traffic lights by using cycle-paths. No-cycling signs like this exist only on roads where no sensible person would want to cycle anyway. Motor vehicles do nothing to lend anywhere a sense of "place", and they are rightly removed not only from city centres and residential areas, but also from main routes for cyclists. Stick to cycle-routes and a cyclist finds not only fewer traffic lights and routes which are more direct than those available to drivers, but also he/she will ride along real streets where there are people, shops and cafes and not between noise barriers erected to separate motor vehicles from people. Freewheeler once said to me "I do wish cycling campaigners would drive more". He made a very good point. Without knowing what conditions are like for drivers, cyclists can't really make a valid comparison. This is particularly true when considering the subjective and social safety of different modes. In most countries, driving wins over cycling hands down when it comes to subjective safety, and this is a very strong reason why many people don't see cycling as a viable alternative. However, in the Netherlands, the most pleasant and safest conditions are usually to be found when cycling. This is so because motor vehicles have been removed.